File this one under “Movies I Am Surprised I Don’t Own”. Great lines, important story. It was a movie about women in sports that was just completely be about their love of the game. & did you know it has been 20 years since it was released? When I was little, I just loved it because I loved seeing groups of women living their lives. I delighted in Tom Hanks’ antics. I loved seeing women intensely involved in sports. I thought Geena Davis was the bee’s knees. (& still do). Now that I’m older, I still love it. My love has deepened as my values found their way under the umbrella of feminism. I get the indecency of having to wear short skirts as uniforms, to attend etiquette school, — being treated as partial equals. They knew their femininity would be called into question upon pursuing athletics with a passion. They loved it so much they made sacrifices most people wouldn’t have. These ladies did it because they just wanted to play. & that’s why it stands up for me after so many viewings & years. Oh, I always loved this movie too! 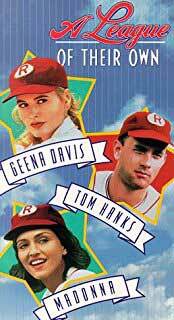 Geena Davis IS the Bee’s Knees. I love this movie. Also, it is on my Dad’s roster of movies he can quote almost in their entirety. One of the many reasons I knew I would fit in amongst your family!